سواءً كنت مسافراً بغرض السياحة أو العمل, شقق آت سبيناكر باي هو خيار عظيم للإقامة خلال زيارتك كوينز تاون. يقع مركز المدينة المثير على بعد 2.0 km فقط. يشكل هذا الفندق ملاذاَ مريحاً للاسترخاء ويمنح زواره فرصة للاستجمام والتجدد، وهو يقع على بعد خطوات من المعالم السياحية الكثيرة للمدينة كمثل: The Ivy Box, رحلات سفاري نهر دارت, حلبة تزلج كوينزتاون. يقدم شقق آت سبيناكر باي خدمات لا غبار عليها وكل أشكال اللياقة وحسن الضيافة اللازمة لإسعاد ضيوفه. يمكن للنزلاء الاستمتاع بالميزات التالية: تسجيل وصول/خروج سريع, تخزين الأمتعة, واي فاي في المناطق العامة, صف السيارات, خدمة الغرف أثناء إقامتهم في هذا المكان الرائع. ادخل إلى واحدة من الغرف 18 وتخلص من عناء نهار طويل بمساعدة مجموعة كبيرة من الخدمات كمثل تلفزيون بشاشة مسطحة, اتصال لاسلكي بشبكة الإنترنت (مجاني), حوض الاسترخاء, غرف لغير المدخنين, مكيف هواء الموجودة في بعض الغرف. يمكنك الاستمتاع بالأجواء المريحة التي تقدمها ساونا, حمام سباحة داخلي طوال النهار. إن شقق آت سبيناكر باي هو خيارك لخدمة الفنادق الراقية في كوينز تاون. Good lake view and good location. Comfortable, spacious apartment with a stunning view. Spent five very enjoyable nights here and I would happily return. Nice, spacious and clean apartment. Beautiful lake and Remarkables view. 20 mins walk to Queenstown. It's just right at the front of the lake with a beautiful view. A room is clean and comfortable with everything you needed. Frankton Arm Walk just down there at the apartment which takes 10 mins walk to the city centre. Well equipped kitchen, you may find anything you needed. All the bedrooms are located at the lower floor situated with a shower or a bath. Helpful staff. Excellent spacious apartments with airy feel and beautiful views of the lake. 20 minutes casual stroll along the water to town centre. Definitely will come back for a longer stay. It was close to everything. Staff were friendly and the apartment was made up every day. Great place to stay. 3 nights , all the things is good ! It offers a truly lake-front view, a stunning sight of the Remarkables, and a serene environment with privacy. After spending two evenings at the Spinnaker Bay, we come to realize that one of the best way to enjoy Queenstown is to plan your stay in an accommodation like what Spinnaker Bay can offer. 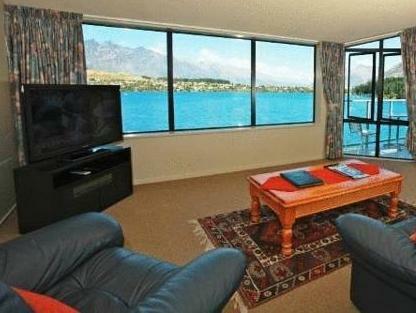 It offers a truly lake-front view, a stunning sight of the Remarkables, and a serene environment with privacy. We stayed in a two-bedrooms apartment. The living room and the bed-rooms are tidy, clean, and well-furnished. Both bedrooms have on-suite bathrooms. Linens are new and clean. The kitchen is equipped with all you need for cooking a full meal. All facilities like the washers, dryers, and kitchen facilities like oven, microwave, etc are well maintained. The lake front walk to the town centre takes about 20 minutes which is comfortable and scenic. The only caution is that parking required skills and patience if you have a big car. The view of Lake Wakatipu from the living room and the bedrooms, kitchen appliances, the log fire stove. The driveway was not that bad from what I imagened from the reviews. Nice walk to the city center. Location out of town and hence quiet, size and quality of apartments and the views. I felt disappointed when we discovered how far out of the Queenstown it was. Taxis were necessary. The web site is misleading. The apartment was fraying at the edges and could do with a good refurbishment. We had a wonderful, relaxing stay at Spinnaker Apartments. Strongly recommended.